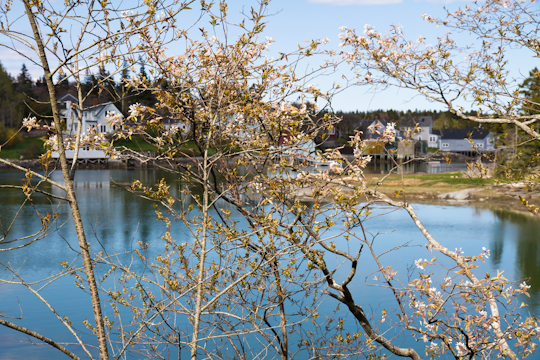 On a visit to Boothbay this spring, we took a little side-trip to the island of Vinalhaven. 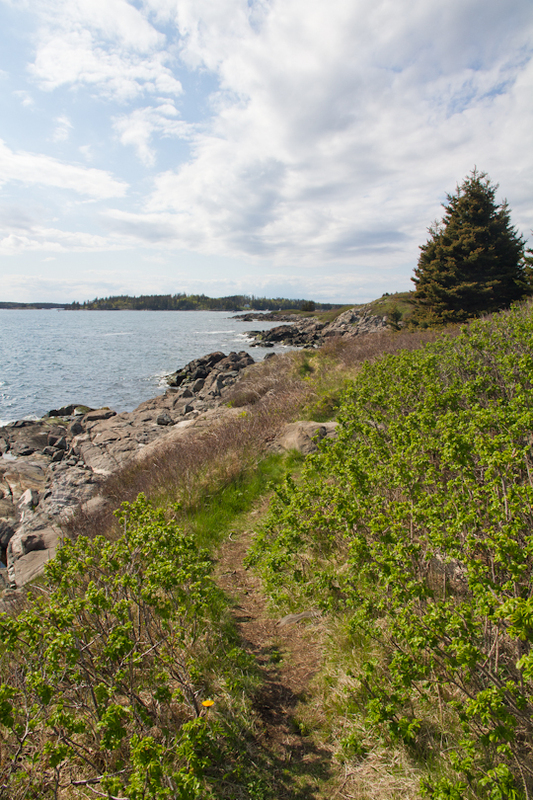 We spent three nights at the very comfortable Tidewater Motel, right in the center of the town of Vinalhaven -- you could not ask for a better location! The Tidewater gets its name because it is literally perched on a bridge, arching over the ebbs and flows of the tides. We were well-advised by Phil Crossman, the owner of the motel and lifelong resident, not to take our car. Apparently taking a car on the ferry is a nightmare, involving waiting in line for many hours with no guarantee of a spot. Furthermore, you really don't need a car once you get to the island, at least not for the whole stay. 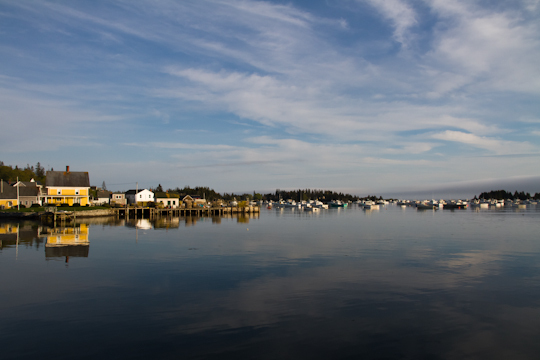 We parked in Rockland (about an hour north of Boothbay Harbor) and took the ferry that leaves several times a day. It's a good idea (if not essential in high season) to book tickets in advance for this 1 hour 15 minute/15-mile crossing. 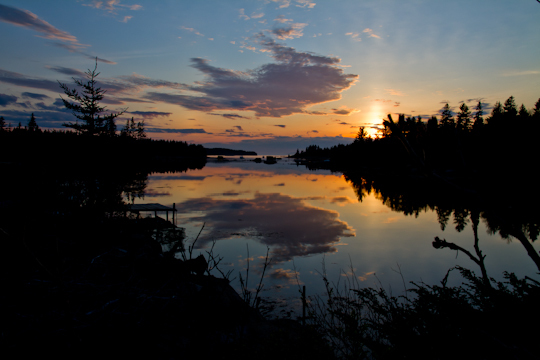 We were very lucky with the weather during our 3-night stay in late May: cool but sunny most days, just one morning of light rain, and some spectacular sunsets. 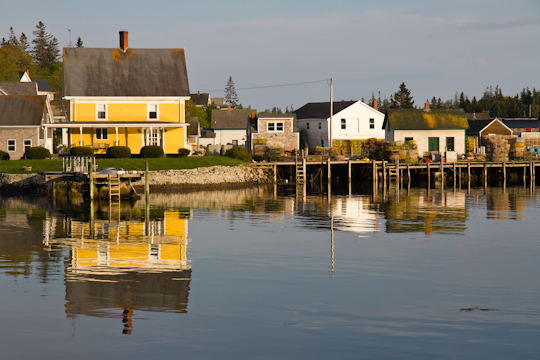 We spent a fair bit of time just exploring the quaint yet not touristy or commercial town of Vinalhaven and its network of side streets. 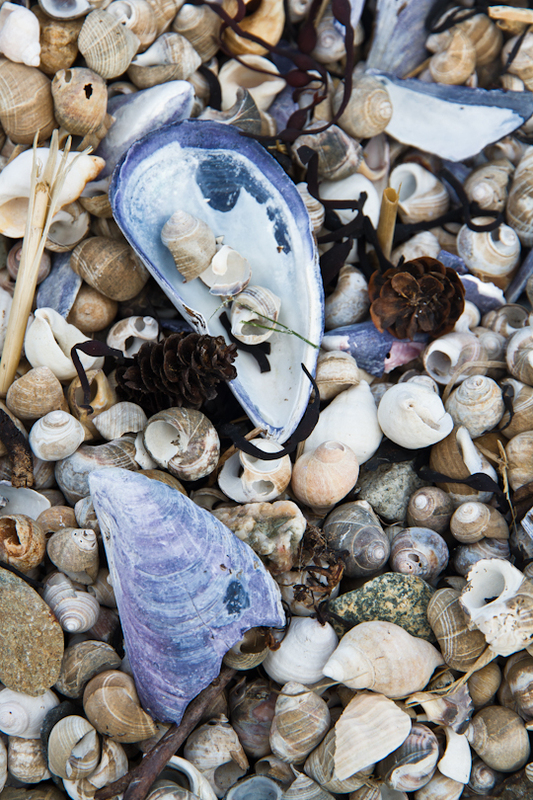 These excursions by foot right from the Tidewater included a visit to the town cemetery and some walks on the Land Trust and Nature Conservancy properties. 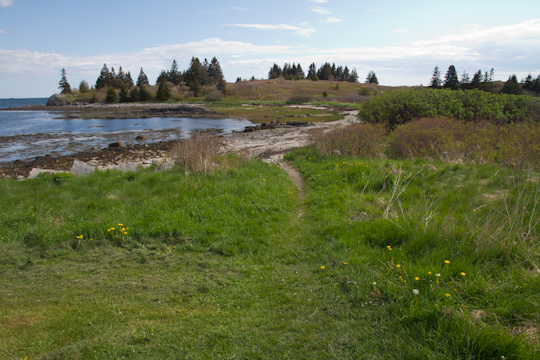 Perhaps my favorite walk was to the relatively new Lane's Island preserve. Although the trails on this 45-acre parcel start just a short walk from the center of town, the spectacular coastal trails and expansive fields make you forget that civilization is so close by. On our first full day on the island, we "rented" bikes from the Tidewater Motel. I use the term "rented" loosely, because as off-season guests of the hotel, the owner let us take them for free. Crime is quite low on an island of 1200 year-round inhabitants, so there was no need to give us locks with the bikes. We rode the bikes down Dog Town Road and then down North Haven Road and Round the Island Road (aptly named), with a worthwhile detour along Poor Farm Road's dirt track. All this only took us about 1/2 day, including stops at a few of the land trust preserves. On our second full day, we rented a car (actually a mini van) from Mr. Crossman for $50 (far less than the cost of bringing your own car over and back). 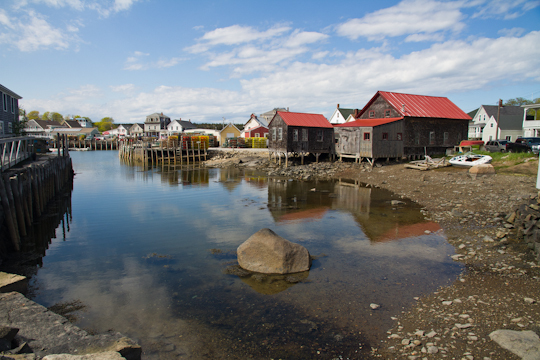 With motorized wheels for one day, we were able to explore the northern end of the island. 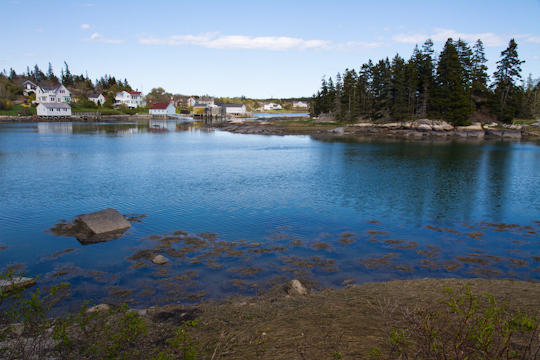 We stopped off at the crossing between Vinalhaven and North Haven, the Fox Island Thoroughfare. North Haven is home (most often just seasonally) to a rather wealthy set, as well as to the famous Nebo Lodge. Nebo Lodge is a high-end inn and restaurant that reopened in 2010 after being closed for 50 years (and of course after extensive renovations). We did not opt to splurge for dinner there during our stay, but it would be a treat to remember. We then visited the grounds of the Browns Head Light, a lighthouse originally constructed in 1832. The lighthouse itself is not open to the public. 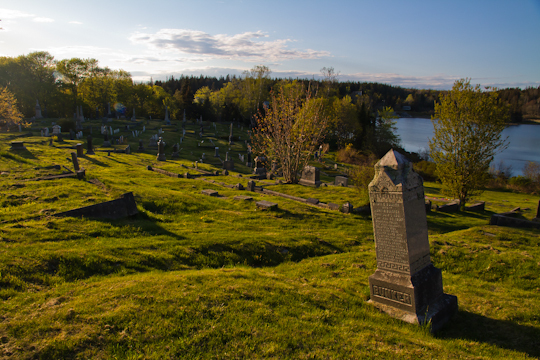 Next, we explored Calderwood Neck and a number of its land preserves. 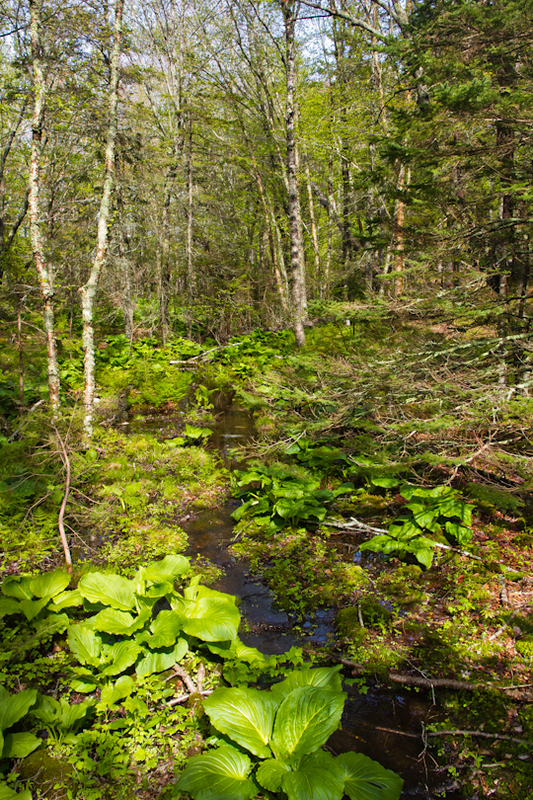 I especially loved the varied terrain at the remote Eleanor L. Campbell preserve. We did do plenty of good eating while in Vinalhaven. We ended up going to the Harbor Gawker not once but twice in three days. 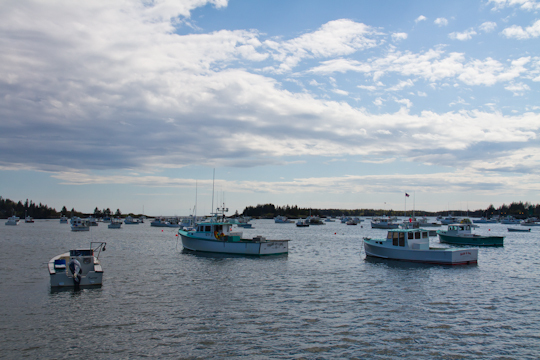 The Harbor Gawker is a real institution, serving up some of the best of Maine's seafood at quite reasonable prices. It's a low-key, order-at-the-counter, no-messing-around sort of place. Their casserole dishes were far from lo-cal, but well worth the indulgence. Of course having a car for a day allowed us to dash off to catch the sunset on Dog Town Road after dinner. 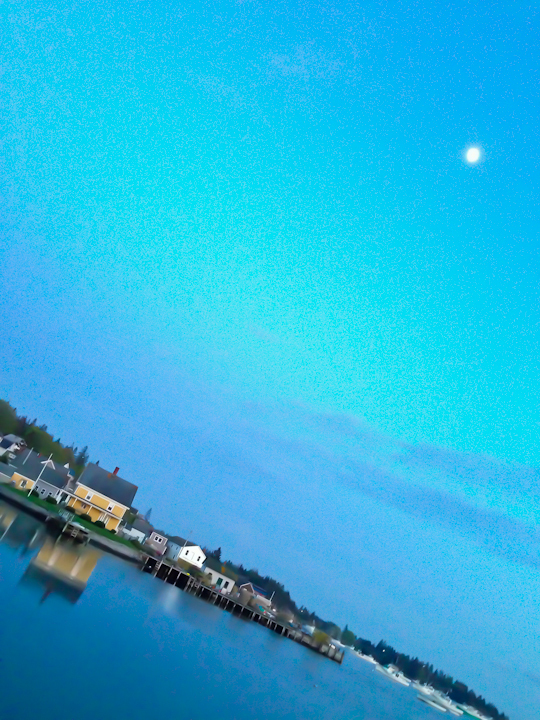 Before or during any visit to Vinalhaven, you must pick up Phil Crossman's book of essays on life in Vinalhaven, Away Happens. Yes, this is him in the cover photo. Phil is not the only author in the Crossman family. 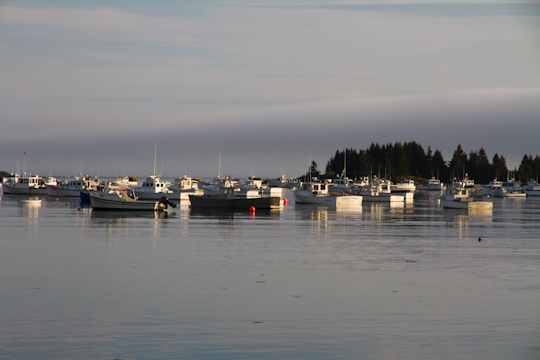 Phil's younger brother, David, has written a series of mystery novels set on Vinalhaven. 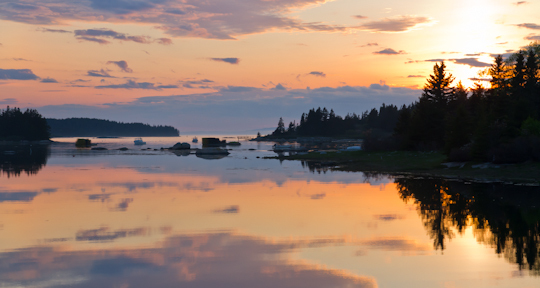 I would highly recommend a visit to Vinalhaven before or after your stay in Boothbay. 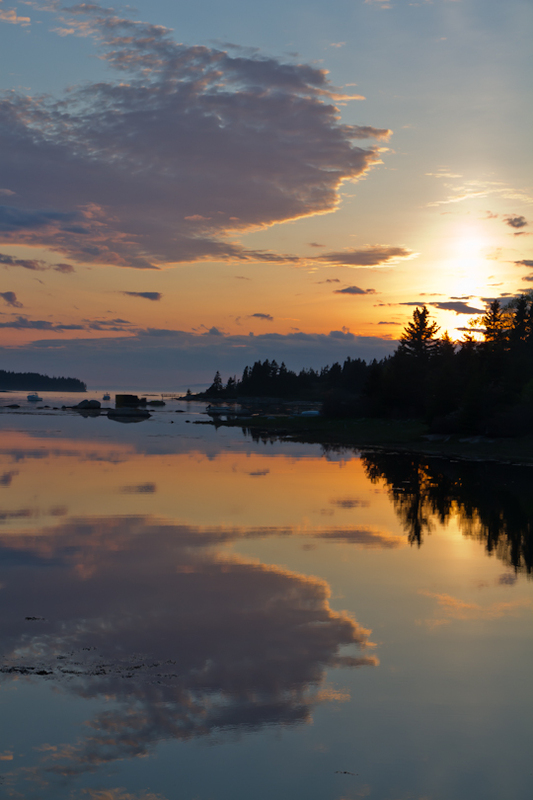 If you are heading further north in Maine, be sure to also read my earlier post and article for BootsnAll on Five Practical Tips for Making the Most of Your Visit to Maine’s Acadia National Park.